Today our post comes with a special message. Thank you Little Man Quinn, you are a wonderful big cousin! We have more to send your way but wanted to get this first one to you. I really enjoy reading the white signs. Has taught me a lot. Four months ago tomorrow I remember yes having my son but will always have the memory of texting Linds to tell her how amazing being a mother was going to be. I know we all never imagined this would be what we were talking or thinking about 4 months later. We talk to Quinn every morning about cousin Nora when we get him dressed. I had sent a picture earlier by text (to Linds) about the amazing motherhood glass ball that you sent for Christmas, that hangs above his changing table. It has now taken on the name "Nora ball". 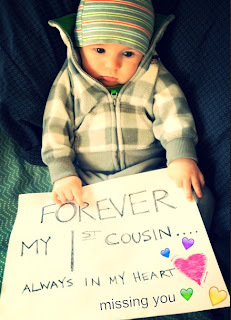 We will forever teach our son about his first cousin and all the hopes we had for the two of them (Nora & Quinn). Unfortunately he will have to learn about a lot of great people that can't be here with him in his lifetime through words and photos. Thanks for letting us have a piece of your mind and heart through your journey the last few months. Makes me cherish what we do have even more. You have all taught us more than you will ever know. Lots of love. Looking forward to seeing you soon.